O’Neill, T., Light, J., & Pope, L. (2018). Effects of interventions that include aided augmentative and alternative communication input on the communication of individuals with complex communication needs: A meta-analysis. Journal of Speech, Language, and Hearing Research, 61,1743-1765. 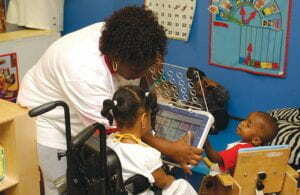 Purpose: The purpose of this meta-analysis was to investigate the effects of augmentative and alternative communication (AAC) interventions that included aided AAC input (e.g., aided AAC modeling, aided language modeling, aided language stimulation, augmented input) on communicative outcomes (both comprehension and expression) for individuals with developmental disabilities who use AAC. Method: A systematic search resulted in the identification of 26 single-case experimental designs (88 participants) and 2 group experimental designs (103 participants). Studies were coded in terms of participants, intervention characteristics, dependent variables, outcomes, and quality of evidence. Results: AAC interventions that included aided AAC input in isolation, or as part of a multicomponent intervention, were found to be highly effective across participants of various ages, disabilities, and language skills. The interventions typically included aided AAC input in conjunction with expectant delay, direct prompting (e.g., spoken, gestural), contingent responding, and open-ended questions. The interventions were found to be highly effective in supporting both comprehension and expression across the domains of pragmatics, semantics, and morphosyntax. Outcomes related to expression were reported more often than outcomes related to comprehension. Conclusion: Aided AAC input may reduce input–output asymmetry and enhance expression and comprehension for individuals who use AAC; the evidence suggests that partners should utilize this strategy. Future research is needed to investigate the effects of AAC input (aided and unaided) on long-term language development for individuals who require AAC.